I have recently become friends with a guy named Andy Finch…….. nothing amazing about that, happens to people all the time. However, not only is Andy an amiable guy, he is also one of the top Hydroponic experts in the country, as well as the guy pulling the strings and levers at hanginggardenuk.com an established company in the West midlands, that has developed a revolutionary Hydroponic system, that allows you to grow food plants literally on the wall anywhere ! 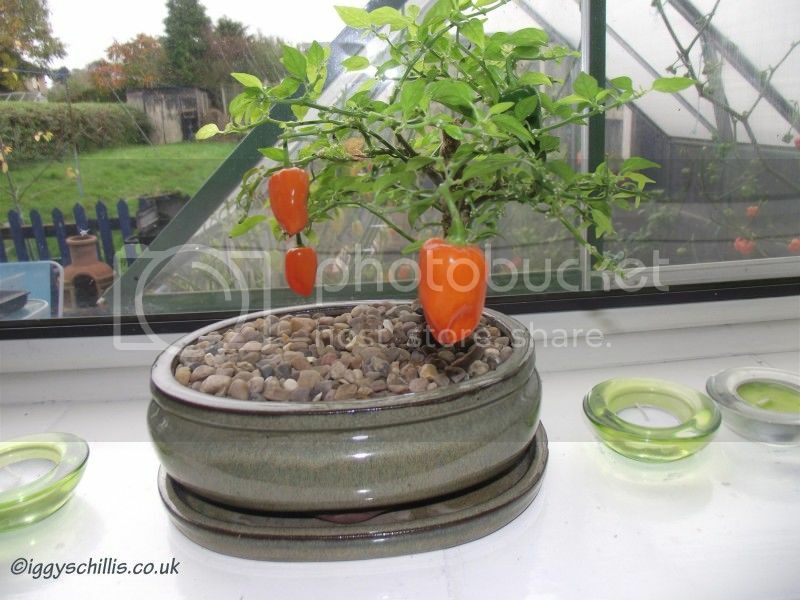 Along the way, he has also spent a lot of time and money developing a stand that allows plants to be grown from seed to fully mature plant, without any growing medium, except a One inch Rockwool cube….. no more clay balls, Perlite or Coco Fibre. The Root Tower, is made from laser cut Correx, and slots together to make a stand.There is a space on top, where the Rockwool cube sits on top of capillary ribbon and the space can also be used for a 3 inch cube, for those that want transplant the one inch. the design allows the roots to trail down as they grow, being separated by a couple of small shelves. 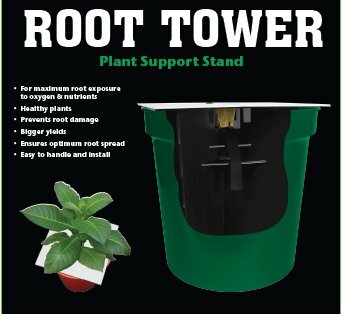 Of course, the benefits of this are huge, no more damage to tender roots, which can easily happen when they are growing through Clay balls, or the holes in net pots…..any damage, however minor, can lead to unwanted pathogens which can damage plants irreversibly.The Root Tower also separates the roots as they grow, allowing for full absorption of nutrients and oxygen. “Any lowering of Oxygen concentration to below the normal, whether in root or soil, is detrimental to many plant processes, disturbing growth, nutrient & water uptake & hormonal balances. With this in mind, it’s easy to see why the Root Tower delivers fantastic results. 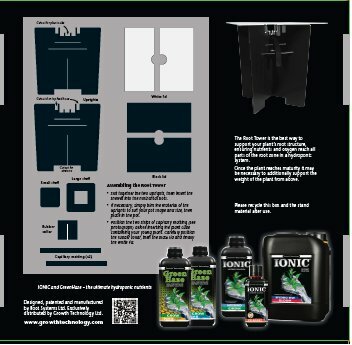 Trials have been so successful, that highly respected Hydroponic company, Growthtechnology.com are on board, and have sole sales rights, with the towers being on sale in shops very soon. Andy has very kindly given me some Root Towers to try, and I’m going to be doing my own trials throughout next season, using the Root Towers in as many different ways I can think of, publishing the results here regularly with photos. I believe I can get some excellent results, using the towers in an Autopot system for instance, and will be trying some different ways of doing this. Andy has also developed a fantastic propagation stand, again made from Correx, which comfortably holds One inch Rockwell cubes, allowing you to germinate your seeds in it, and just lift the cube onto the Root Tower, once sufficient roots have grown. Again the use of thin capillary ribbon aides this. I have already started using the propagation stands, and can honestly say they are the best thing I’ve used for germination in a long time. A purpose-built propagator for the propagation stands, is being developed, and should be available soon. I will write a separate article on the propagation stands, when I do my major sowing, probably some time in December. Andy can be contacted via his website, or you can contact me here, and I’ll pass him your details.